Rev. Williams, a native of Beaumont, Texas, is one of six children. Three of his siblings are pastors. He attended Starlight Baptist Church in Beaumont where he was a musician, playing the drums for nine years. 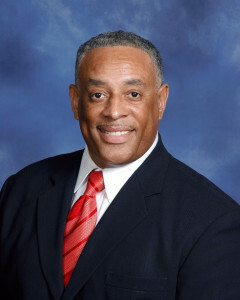 Rev Williams moved to Houston in 1987 and united with Brentwood in 1988. He responded to his calling to the ministry in 1990, under Dr. Joe Samuel Ratliff's leadership. He completed studies at Southwest Baptist Theological Seminary. Prior to joining Brentwood staff as Minister of Facilities Management in January of 1997, he worked for the Santa Fe Railway for seventeen years. Currently Rev. Williams facilitates 13 of the 100 ministries that exist on the Brentwood Church Campus. He strives to enhance the church activities and facilities while reaching people, developing believers and engaging in missions. Rev. Williams is the proud parent of two children, Kevin Wayne, II and Kelsey Denise.